Two weeks ago I looked at the way Walt Simonson handled Thor’s mythological background and supporting cast. 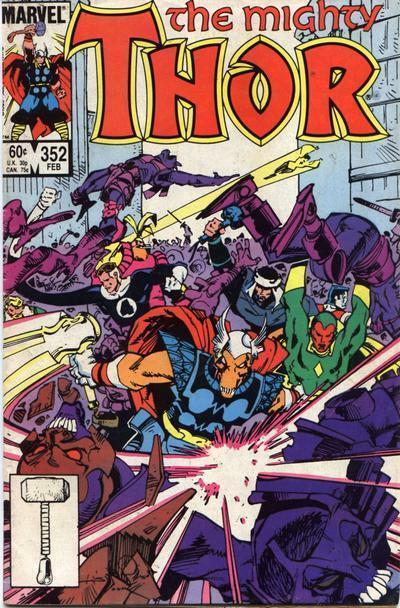 This week I’ll dig in directly on the first part of Simonson’s celebrated era with a look at issues #337-353 of Thor. There were a lot of parts scattered on the floor when Simonson took over this book. Thor has been many things through the years — cosmic hero, earthly doctor, Avenger, thunder god, and good old fashioned superhero. 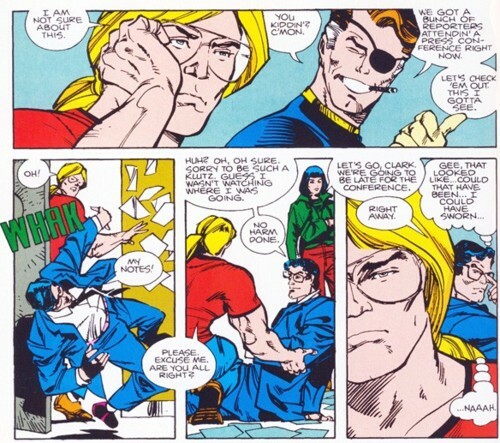 Unlike Jim Starlin, who would reinvent his cosmic heroes by sending them off into a corner of space he could make his own, Simonson roots his Thor in the Marvel Universe, giving him a stake in mortal affairs and having him turn to Nick Fury and S.H.I.E.L.D. to fashion a new civilian identity — Thor even absurdly calls into work to explain his absence when he was distracted by saving the universe. 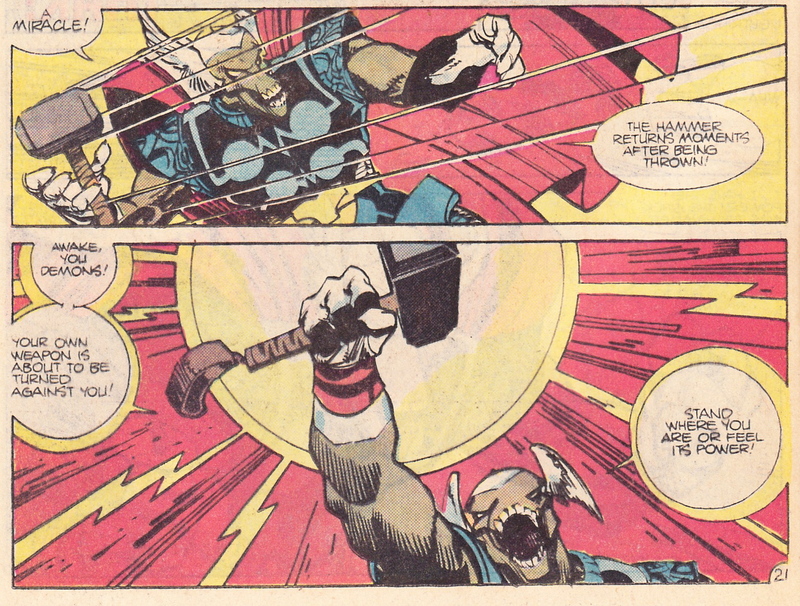 At the same time, Simonson expanded Thor’s canvas, by teaming him with Beta Ray Bill to battle an alien invasion from the heart of the galaxy, and putting Thor on the front lines of a fire demon invasion of Asgard. 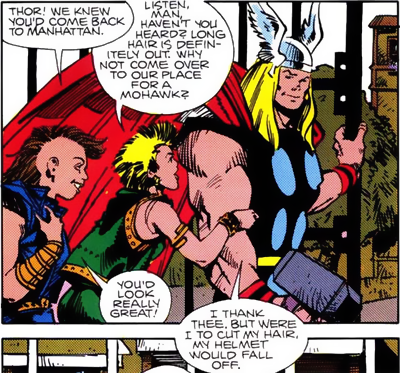 It is this juxtaposition of the infinite and the mundane that gives Thor its unique strength — and as I enthused in part one of this review, Simonson was unequaled in the way he handled this aspect of the series. I won’t cover Simonson’s storyline in detail — Chris Sims already did a great job of hitting the highlights of this run over at Comics Alliance — and I don’t want to spoil the tale should you choose to read one of the many reprints that are presently available. But to paint in broad strokes, this first part of Simonson’s run sees Thor called to defend earth and Asgard, first against a mysterious alien spaceship, then later against a “wild hunt” invasion led by dark elves, and finally a last stand of the gods against Surtur, the fire demon fated to destroy the universe (a DOOM-driven subplot Simonson developed, one page at a time, for the better part of a year before bringing events to their climax). Along the way we see Thor gain a new civilian identity and attend to the prayers of “the last Viking,” and we’re also treated to rich subplots revolving around Sif, Baldur, and Odin. The run examines themes of duty, destiny, depression, and obsession, but mostly it is a broad and fast-moving adventure story told with style, humor, and joy. 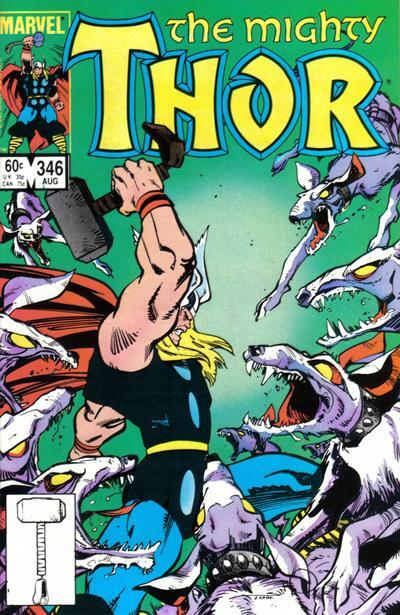 Simonson literally blew up Thor when he took over the book with issue #337, with his signature creation — the “alien Thor,” Beta Ray Bill — shattering the old Thor logo on cover. 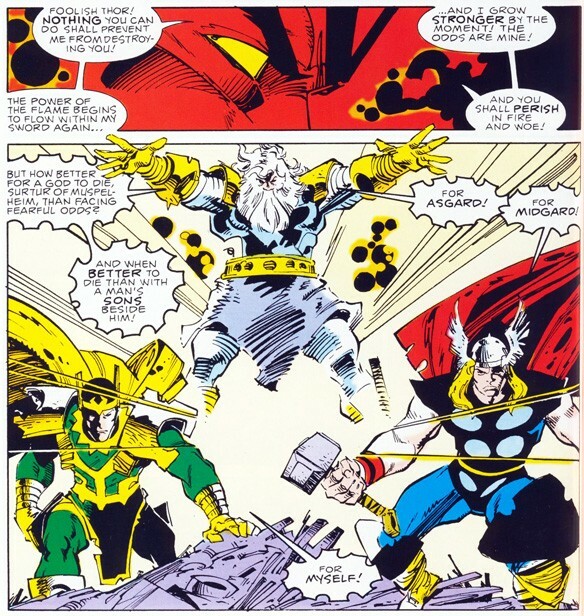 But Simonson wasn’t kicking over the card table, however it seemed at the time — when Beta Ray Bill does the impossible, and lifts Thor’s hammer, it reminds us of Thor’s original virtues, and serves to deepen our appreciation for Thor when we see his noble reaction to being replaced, however briefly, by an alien interloper. It’s a clever storytelling judo-flip, and it wouldn’t be the first time Simonson took the book in unexpected directions. But even when Thor turns into a frog (! ), the book remained on the rails, thanks to Simonson’s life-long study of the series. Simonson grew up on Marvel comics — in the letters column of issue #347, Simonson reveals how his life was touched when Stan Lee sent him a missing Thor back-issue when he was a teen — and by building respectfully on the foundation established by Kirby & Lee that he absorbed as a youth, Simonson restored a book that had foundered for several years to the top of Marvel’s line with expansive pencils and deft scripting that made everything old seem new again. One of the things that makes this series sing is that it is a tale that can be told only in comics. This isn’t a novel masquerading as a comic — the action is relentlessly visual, and while Simonson isn’t afraid to write thought balloons or have his characters speak aloud their inner monologues, neither does he descend into long dialogue sequences at the expense of action. 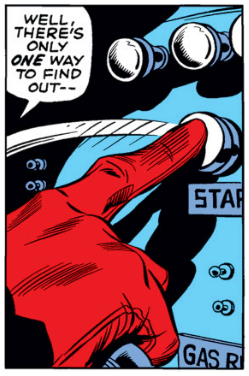 Likewise, this book isn’t auditioning to be a movie — the action is cheerfully compressed, without regard for cinematic conventions, and we crazily jump between storylines in the best tradition of serial adventure comic books. 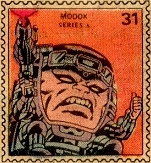 With dozens of speaking roles, and action that sprawls across time and space, Simonson’s epic would require three movies and hundreds of millions of dollars to bring to the screen — and that film would still be inferior to this comic book form, where we effortlessly change focus and dip in and out of multiple characters’ minds in a fashion that comics, of all forms of fiction, still does best. This is a big story, drawn with bold lines — Simonson’s landscapes are wide and clean, with the night sky above Asgard swarming with rainbow rays and Kirby Dots. Those landscapes are peopled by heroes with heart — tormented champions like Baldur and Beta Ray Bill, wise Odin, and steadfast Thor — but Simonson’s epic vision is leavened with the absurd, such as when Simonson cheerfully hangs a lampshade on the impossibility of Thor masquerading behind a simple pair of glasses … by having Thor bump into Clark Kent himself! The run is not flawless. Some of Simonson’s solutions smack of fiat — such as that possibly-too-cute-for-it’s-own-good secret identity bit with Clark Kent; or an ancient Casket of Winters, seemingly shattered beyond repair, but put back together by a determined old veteran with a tube full of superglue. The story also expands as it goes along, and the series gets away from Simonson a bit. Compared to the brisk Beta Ray Bill stories that opened the run, the conclusion of the Surtur saga feels a little bloated. With so many supporting characters competing for spotlight time, there’s an entire issue (#352) where Thor does not appear at all — he’s knocked cold while Odin battles Surtur at the gates of Asgard — and Beta Ray Bill, the Avengers, the Fantastic Four, and the gods of Asgard wrestle with demons all across the earth. But these are quibbles. Long time readers of Longbox Graveyard may remember my reply when this blog was invaded by Mars last July, when I wrote Simonson’s run was “… in some ways is a bridge (a rainbow bridge?) between the Bronze Age and what was to follow.” A dozen “issues” later, I stand by those words. Simonson’s Thor really is a bridge between the Bronze and Modern comics ages — a modern take on Silver and Bronze age comics tropes, fast-paced like the comics of old, with the big moment sensibility and epic visual scale of modern books. This is how you reinvigorate a series. Simonson didn’t kill Thor, and he didn’t blow up Asgard. There was no rebooting, re-chewing, or renumbering. Just solid, fundamental storytelling, brilliantly drawn and scripted, respectful of the past but freshly framed and unafraid to adorn the mythos with new characters and legends. Simonson caught lightning with this classic run, giving us the finest Thor stories ever told and leaving the title better than he found it. If you haven’t read these books, read them now. And if you’re already read them, then read them again. Posted on September 28, 2011, in Reviews and tagged Beta Ray Bill, Marvel Comics, Marvel Universe, Nick Fury, Simonson, Thor, Walt Simonson. Bookmark the permalink. 19 Comments. Yes! I remember when you let me borrow these and I couldn’t put them down. You must have put them down eventually, because I have them in the collection. You can borrow ’em any time you like. No more of this buying a treasury edition nonsense when I have the originals bagged, boarded, indexed, and immediately to hand! The Beta-Ray Bill episode of the animated Avengers: Earth’s Mightiest Heroes from a few months back was terrific. I thought they caught his nobility in a way similar to the issue you referenced above. I don’t own a ton of Thor books any more (mostly just the Wagnerian saga I mentioned in a prior comment), but I really ought to pay attention next time my LCS marks down the discount bins to 25-cents (only a couple times a year). 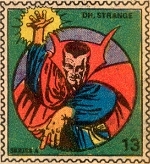 Or look through the public library for Thor collections. That Avengers animated series comes highly recommended. I’ve seen an episode or two and enjoyed them, but the boys and I can’t seem to bite off more than Young Justice and Green Lantern: The Animated Series in our comic book cartoon rotation. I’ll catch up with it someday … and there is a new Avengers animated series on the way, intended to better tie into the movie universe I think. 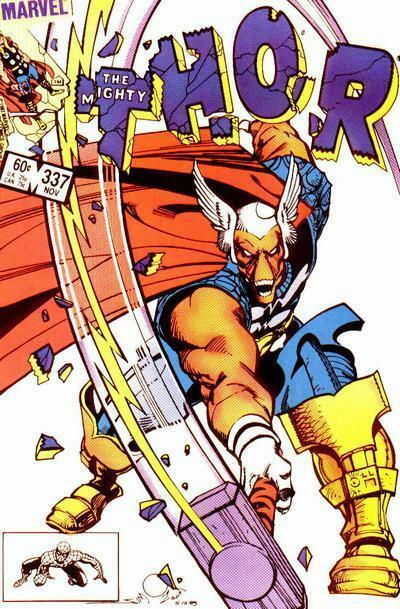 I would like to see an animated Beta-Ray Bill, though. Were Bill to appear in the post-credits teaser of the next Thor movie I’d squeal out loud like a little girl. My own Thor collection is the Simonson run, and a bunch of stuff I really should sort sometime. Simonson’s Thor really put everything else in the shade. I doubt you’ll find any of them in a .25 box any time soon. Thor is definitely one of my favorite characters. I love fantasy books and superhero comics. When done correctly, Thor is a great amalgam of the two. I’m still in the process of tracking down Simonson’s complete run. While doing that, I need to unload the atrocious Thor comics from the ’90s. Time spent tracking down this run is time well spent. The original books aren’t too terribly pricy, though the version-of-choice at this point are likely to be the Marvel Omnibus volumes. They’re also available digitally … Enjoy! Thanks Paul what a great article. I thoroughly enjoyed reading your look back at at one of comics best runs! That last panel is one of my favorite comic book pages of all time. Great job! Thanks, Sam! 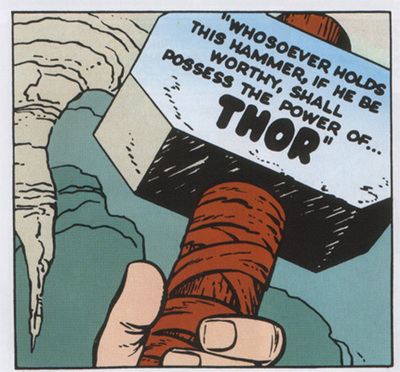 I do think that last panel captures the whole ethos of Thor as Simonson portrayed it … and I suspect it has been a bit of a North Star for the guys developing the film side of the property, too — it certainly rings true when you look at how they’ve handled Loki, for instance. Now they just need to more thoroughly set Thor and Odin against each other over Thor’s attachment to Earth, and we’re there! 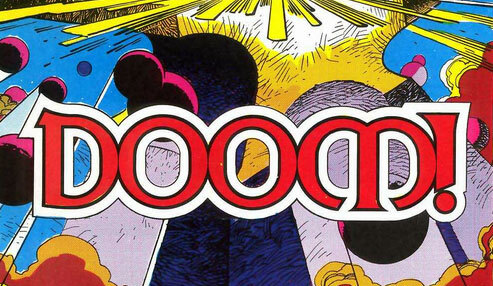 I always intended these reviews to be just the first of a series on Simonson’s Thor. I’m only about a third of the way through his run here. I intended to get back to Thor when second film came out, but real life intervened. I will return, eventually.